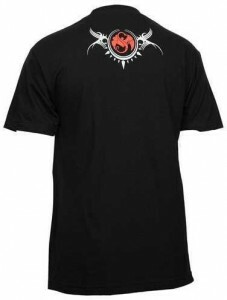 Strange music became the number on independent label in the world by playing by its own rules: show that “FTI” spirit with this 100-percent cotton black tee. Available in M, XL, and 3XL, this t-shirt features “Strange Music” written on the front in a brazen “anarchy” design and a Snake and Bat logo on the upper back. Click here to order yours today.